Have you got your DNA in yet? Home » 2018 » Have you got your DNA in yet? With Christmas and the New Year fast approaching, now’s the time to submit your DNA to ensure that you will get results before the end of the year. It is recommended that your samples are received at Angus Australia by the first week of December should require results prior to Christmas or for early January to allow for the Christmas holiday period. 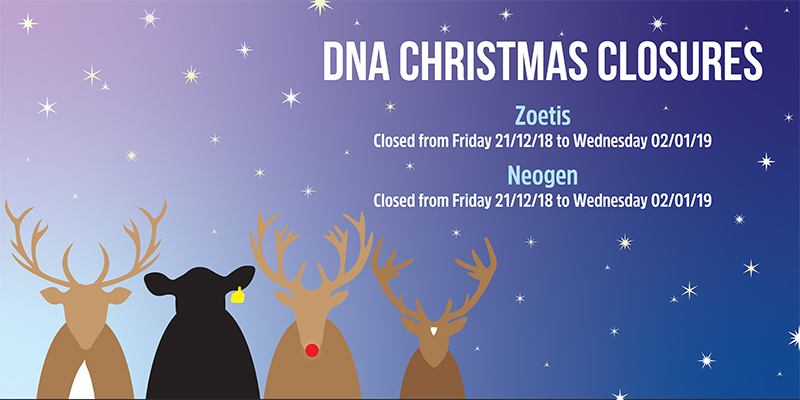 Zoetis – closed from Friday 21st December, 2018 to Wednesday 2nd January, 2019. Neogen – closed from Friday 21st December, 2018 to Wednesday 2nd January, 2019. If you have any questions regarding these times or DNA in general, please contact the Member Services team on (02) 6773 4600 or regos@angusaustralia.com.au.